Here at Calendar Lady we have a new department for sweets and confectionery. View the full rage of Personalised tins of Sweets here. So why not have your details and logo printed onto a customised tin of sweets, give them away to your customers and you'll always be advertised. Customised tins of sweets have plenty of room to print on whatever you like! 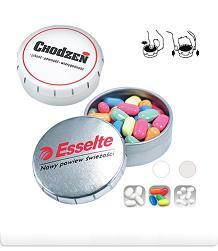 Other promotional and personalised items besides our Customised tins of sweets click here. To find out more about our Customised tins of sweets click here and fill in the contact form and we'll get straight back to you.